Welcome To The Doll Den. Photo by Olivia Luna. BOTTOM LINE: A well-researched and diligently crafted musical based on the true stories of America’s first all-female progressive radio station. Welcome To The Doll Den follows the evolution of the fictitious WGAL, America’s first "All-Girl" radio station based in Memphis, TN, from its picture-perfect conception, staffed with hopeful "jockettes" broadcasting programs designed specifically to women, through its gradual rise to fame and attempts to become a politically progressive media platform, to its ultimate acceptance of employing male broadcasters as well as a new name, WALL. WGAL is the brainchild of Stan Reynolds (the fictitious counterpart of real-life Sam Phillips), played by the versatile Elena Kritter. With Mrs. Polly Reynolds’ (Lizzy Ana Lincoln) leadership and the resourcefulness of general manager Doris (Rev. Yolanda), a team of aspiring young women become radio announcers and the voices of their generation. Electric Eye Ensemble's fictitious account is based on the true story of WHER (1430 kHz AM, slogan "1000 Beautiful Watts"), which first went on air on October 29, 1955 and lasted for 17 years. It was later renamed WWEE. Broadcasting pioneer Vida Jane Butler aka "Janie Joplin" was one of the founding announcers. Traces of historical accounts from WHER’s early days find their way to Electric Eye Ensemble’s magical retelling. Vida Jane Butler, performed by the ethereal Leah Ogawa, was given her alias because her birth name sounded "too southern." Butler’s signature sign off “be good and you’ll be happy” became both WGAL’s slogan and Polly’s catch phrase. The station’s integrity is tested against a backdrop of rapid social changes and political unease: during a test run of Open Mic, a new program initiated by Frances (Evelyn Dumont), one of the jockettes, a listener calls in with racists comments about the station’s choice of music (in this case Ella Fitzgerald). The disappointed team soon discovers that there’s still a long way to go before the station can reach and change the minds of Americans all over the country. The production at the Tank is Electric Eye’s second rendition of the piece, first conceived and presented at Dixon Place. The play, sprinkled with delightful musical numbers, reveals its truly collaborative creative process, with each robustly developed character of unique perspectives. As Polly juggles her roles as both the station owner's submissive wife and the confident leader of WGAL announcers, Lincoln exudes a strength that’s soft yet enduring. Emily Johnson-Erday impresses with subtlety as Helen Jenkins, a woman whose evolution coincides with that of WGAL. And Rev. Yolanda’s station manager-turned-radio host brilliantly balances the courage and vulnerability of a woman in the frontier of political media in the post- Vietnam War America. The production has a steady flow that documents the entire rise and fall of WGAL, this thoroughly comprehensive approach might also be its only flaw. One might find the show somewhat static and lacking in surprises, as if everything were neatly folded in place. In optimizing the clarity of the piece and trying to capture the rich source materials, the team might have done well to sacrifice a few bits in order to create a more dynamic structure. Lastly, the production design of the show is dazzling: Andrew Murdock creates a set completely made of paper; even the tables are made of poster board. Jeannipher Pacheco’s costumes are as if straight out of a 60s magazine, accurate to the last detail. The decorative aesthetic of the show makes it seems like a page from a retro newspaper or a comic book: stylish, nostalgic, and whimsical in KodaChrome. Welcome to the Doll Den is a truly beautiful show that instills us with hope for constant progress, and reminds us of the hardship of those who came before. One must also applaud the relevance of Electric Eye’s revisiting of the “Her”story of the pioneering radio station. The trials and errors of WGAL serve as a mirror for the reality we face today. In Welcome to the Doll Den, their successes are celebrated and their obstacles acknowledged. These women pioneers made a difference in an industry dominated by men, and their fight is meant to be continued by their daughters and granddaughters today. 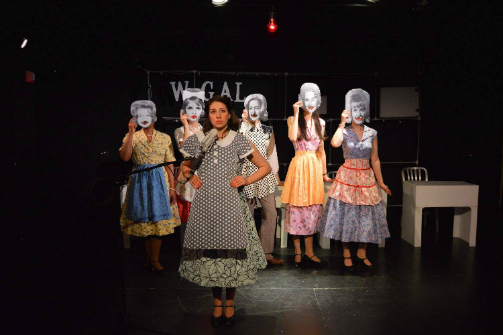 Welcome To The Doll Den is devised by the Electric Eye Ensemble, based on true stories. Directed by Sarah Plotkin. Production Stage Manager and Assistant Director is Jazelle Foster. Dramaturg and Choreographer is Julia Corrigan. Sound Designer and Lead Lyricist is Joshua Langman. Lead Composer and Music Director is Emily Johnson-Erday. Set Designer is Andrew Murdock. Lighting Designer is Sophie Talmadge Silleck. Costume Designer is Jeannipher Pacheco. Pianist is Ethan Ness. The cast is Evelyn Dumont, Emily Johnson-Erday, Elena Kritter, Lizzy Ana Lincoln, Leah Ogawa, Alana Thomas, and Rev. Yolanda.